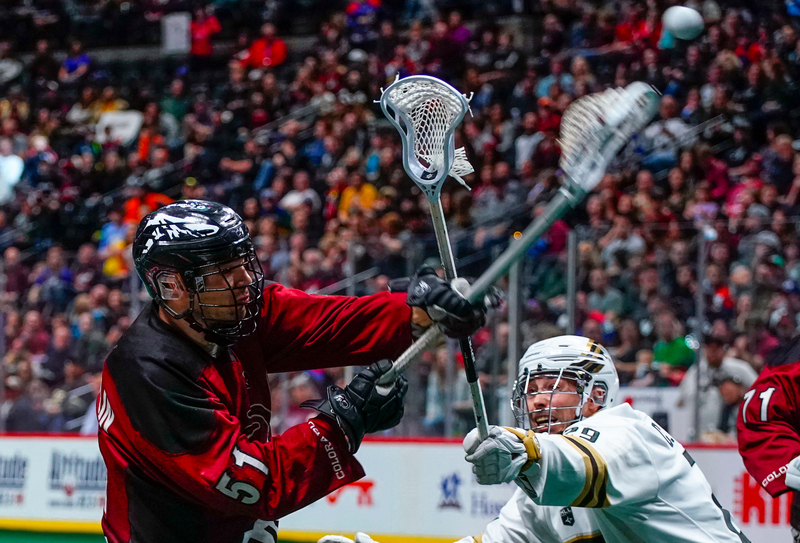 Things are looking grim for the Vancouver Warriors’ playoff hopes after a pair of losses to the Colorado Mammoth this past weekend. The Warriors fell to 4-10, two games behind the Mammoth for the last spot in the Western Division. Saturday’s 14-4 loss was the worst of the season. The Mammoth, knowing how important it was to gain ground over the Warriors, came out on fire and showed no signs of travel fatigue, despite having played a day earlier in Vancouver. Being the home team, they probably had a bit of an easier time coming back to a familiar environment than their opponents. Kyle Killen and Eli McLaughlin, especially, were pumped and ready to go, leading their team with five goals and four goals, respectively, while McLaughlin also had a whopping eight assists. The Mammoth are currently in possession of the West’s last playoff spot with a 6-8 record, two games up on the Warriors. It wasn’t until the second that things started to go south for Vancouver; they ended the first only down 3-2. But the Mammoth scored seven straight in the second to go up 10-2. Cory Vitarelli scored a classic quick-stick goal, finishing Ryan Lee’s cross-crease pass at 1:47. Vancouver didn’t do too badly after that until the 7:09 mark when they allowed Eli McLaughlin to score twice in 30 seconds. McLaughlin then scooped up a loose ball late in a possession and fired it to Kyle Killen who was all alone in front at 10:05. Thirty seconds later McLaughlin found Vitarelli in a similar spot for an 8-2 lead. Chris Wardle scored less than a minute after that – again, on pass out front from McLaughlin. Killen capped the run with a behind-the-back power play marker after Zack Porter executed an ill-timed slash on Robert Hope after he’d already knocked him down and knocked his helmet off. McLaughlin was in on every Mammoth goal in the second period. Keegan Bal stopped the Mammoth run with a flukey power play goal. Steve Fryer stopped Bal’s shot but the ball trickled in anyway with four seconds left before the half. Unfortunately for Aaron Bold, the Mammoth kept finding their forwards alone in front of his goal. The Warriors’ defenders appeared too caught up in watching the ball than their marks which allowed for so many chances. McLaughlin and Jacob Ruest increased the Mammoth lead to 12-3 in the third. Killen’s fifth goal of the game came 1:22 into the fourth quarter on a power play. The Warriors have only four games remaining to catch up in the standings. Two of those teams are against the Wings and Rochester, the weakest the East has to offer this season. Colorado also has four games left including one against the Knighthawks.